Five years ago, L.A.-based vocalist Janis Mann paid exquisite tribute to timekeepers, alternating among a quartet of preeminent drummers on A Perfect Time. 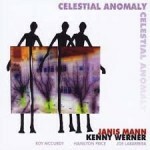 Now, two albums later, two of the four—Roy McCurdy and Joe LaBarbera—return for the equally sublime Celestial Anomaly. This time, though, co-billing is ascribed to pianist Kenny Werner. Bassist Hamilton Price, as impressive as his better-known bandmates, completes the rhythm section. Astronomically speaking, the title refers to an apsis, the farthest point between two bodies in elliptical orbit, which seems an odd insinuation. If the two bodies are Mann and Werner, then their union couldn’t be closer—a masterful fusion of musical minds. And though Werner’s playing is expectedly brilliant, the entire ensemble, whether anchored by McCurdy or LaBarbera, is tight and interdependent.